Gain your balance, grab the wrist of the arm being grabbed then suddenly step away, pulling with the strength of both your arms and using your weight to pull free of the grip. You have been grasped painfully by the hair. Place your nearer hand on the elbow of the arm that is holding you and pull your body hard against it. this will reduce some of the pain. 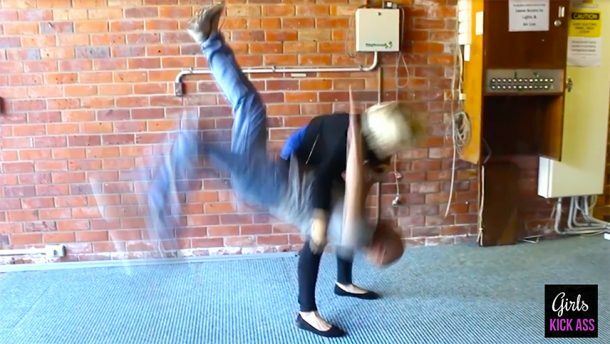 Step closer to person grabbing you, turning as you step and use the momentum of the turn and your weight to hit them in the middle of the face as many times as necessary. You have been pushed to the ground. Protect yourself from the impact (a skill you will learn in the course) and immediately turn on one side, curling your knees towards your stomach and elbows towards your chest with your head tucked behind your forearms. From here it makes it more difficult for the aggressor, giving you opportunities to get back up and escape. An aggressor is sitting on top of you. Place one hand behind their head and bring the foot of your opposite leg near your hips. Pull his head towards your shoulder then push upwards with your bend leg. This will give you space to begin to escape or even dislodge your aggressor. Someone has wrapped their arms around your waist, from the front, despite your objections. Bring your arms towards their shoulder. Place one arm horizontally against your aggressor throat then slap your own wrist hard as many times as necessary. Victim profile avoidance – Learn what potential aggressor seek in victims and circumstance so that you can protect yourself at the best time, before it happens! What is the difference between personal protection for girls and learning full martial arts? (To do with goal & situation) + warm up. Assertive positions – Develop postures and positions that make feel and appear capable and in ways that allow you to protect yourself. Asserting your right not to be assaulted – This relates to victim profile avoidance but is one step beyond to avoid potential bad situations. Using body mass for hitting hard – Learn how to hit with greater impact, should a situation be out of hand. Protective positioning and transitioning to assertive positions – Protective positions are the first step. Moving to assertive positions is essential as situations escalate. Evasive movements – It’s harder to hit or grab a moving target. These manoeuvres are fast and balanced. Being grabbed on the hands, wrists and arms – learn to use leverage to escape grips from stronger aggressors. The statistically most common assailant – it’s not what you’d think (combined with warm up). Protecting yourself on the ground. Being grabbed on the hands, wrists and arms combined with using body mass for hitting hard. Being held on the neck, standing against a wall and on the ground. Being grabbed on the hands, wrists and arms combined with using body mass for hitting hard from different angles and positions. Review being held on the neck standing, against a wall and on the ground. Being grabbed around the body from the front and back with arms free and pinned. Mothers welcome to join in.